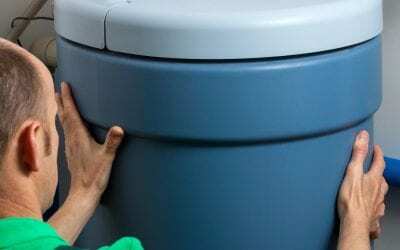 Calgary, do you really need a water softener? Hard Water makes many people’s skin irritated and dry. Hard Water leaves deposits in piping. Hard Water scales on fixture surfaces. Hard Water plugs fixtures and appliances. Hard Water leaves a white film on glass. And it is a resounding fact that Calgary indeed has hard water. How do we know this? It is easy to determine with a simple test. Even our amazing City posts the results for the public on their website. Some of you may not know that it is different for North Calgary then South. Either way, you have hard water with the Northside slightly less than in the South. What is also interesting is looking at the times of year the water is harder than others. Each year we see spikes for approximately 4 months through our winter season. So now that you know the facts, how can improve your situation by protecting your home and your skin all at the same time. As a bonus you will use less soap to do dishes, in your washing machine, and be protecting expensive appliances and your water heater. Did you know if you have a tankless water heater you are voiding the manufacturer’s warranty if you do not have a hardness level below their stated levels (Yup, Calgary is way above those levels). Installing a true water softener is the key to ensure you are getting the soft water you want. There are alternative’s and unfortunately most do not hold up to expectation. If you do want an alternative we suggest a unit utilizing a time-release citrus filter. This will limit scale but will not be effective in turning water from hard to soft. The reason a water softener is able to do this magic trick is because it is performing a true ion exchange. Water Softener’s, that use salt, exchange calcium and magnesium (which makes the water hard) for sodium ions. And voila! You have soft water. It is able to do this repeated times through a regeneration of its resin bed. Our units are High Efficient and use almost no more electricity than a plug in clock. They also last a long time! The cabinet and tank are even a Lifetime Warranty. With it’s upflow design it has by far the most efficient regeneration on the market, as well as a cool municipal feature which creates less regeneration required. It even recognizes if you left town and have not been using it, so again no regeneration is needd, but will keep fluid in the brine to ensure bridging and other common issues do not occur with your unit. So, now you have the details and facts and you may decide you are just fine without a water softener. And hey, that is totally cool with us. BUT, if you realize there is a better life for your skin and home just around the corner, give us a call at 403-205-2782 or reach out at www.aqualityplumber.com. We would be happy to discuss this further. By the way, if you made it to here, you get the best part. At the Calgary Fall Home Show, we have a Super Special on for $500 off our regular pricing. Just come by our booth, #441, and say Hi and we can book you in right there. And don’t forget to fill out a draw card too as someone is going to win a free unit installed valued at $1795.00! This is by far the best price we have ever done for these units, and we pulled favors to make this possible, so take advantage.